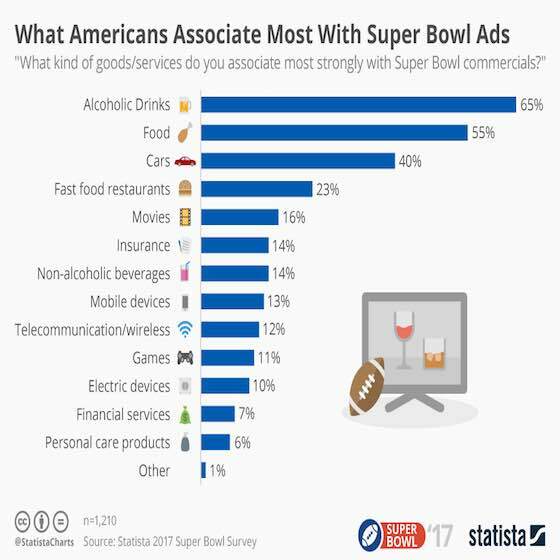 Our infographic charts what kind of goods ands services Americans associate most strongly with Super Bowl commercials. Last year, around 112 million Americans watched the Super Bowl on television, with many of them eagerly anticipating the commercials as well as the on-field action. This year, a 30-second spot during the Super Bowl costs around $5 million, a steep price many companies are willing to pay in the hopes of grabbing viewers' attention. The epic "Battle of the Brands" really picked up steam after Apple aired its legendary Macintosh commercial in 1984. That went down in history as the first blockbuster Super Bowl advertisement, paving the way for the phenomenon that followed. Many other commercials from down through the years stand out such as Pepsi's 1992 spot with Cindy Crawford, 1999's Whassup? from Budweiser and 2010's hit "The Man Your Man Could Smell Like" from Old Spice. Budweiser and other beer companies must be doing something right on Super Bowl Sunday because as our chart shows, 65 percent of American viewers associate commercials during the broadcast with alcoholic drinks. That's according to Statista's 2017 Super Bowl Survey which also found that people also strongly associate food and automobiles with Super Bowl commercials. The chart above shows what kind of goods & services Americans associate most strongly with Super Bowl commercials. NFL Football: "What Americans Associate Most With Super Bowl Ads"